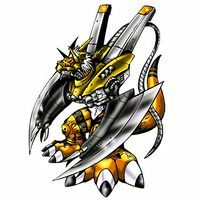 A Cyborg-type Digimon that evolved from Data-attribute Growmon. 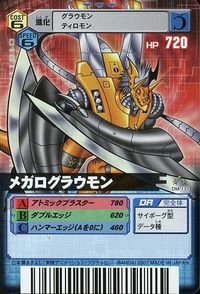 Armed with the strongest metal Chrome Digizoid, it also possesses anti-air capabilities with its two vernier. Its Special Move is an attack fired from both of the gunports on its chest that destroys the opponent on the atomic level (Atomic Blaster). 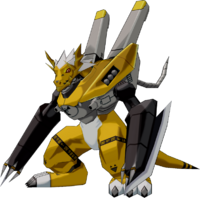 A Cyborg-type Digimon that evolved from Data-attribute Growmon. 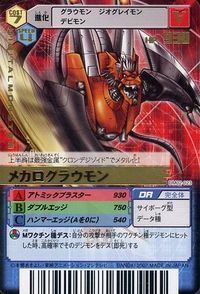 Armed with the strongest metal Chrome Digizoid, it also possesses anti-air capabilities with its two vernier. Fires beams from its chest-mounted cannons that destroy the enemy at the atomic level. Double Edge  ダブルエッジ Daburu Ejji Radiation Blade Attack/Plasma Blade Slices the opponents with both Pendulum Blades at once, causing an explosion. Fires electricity from its chest-mounted cannons. Punches the enemy with the Pendulum Blade of one arm. Megalo Growmon (Orange) is an unobtainable enemy Digimon. It can only be obtained as a collectible card. 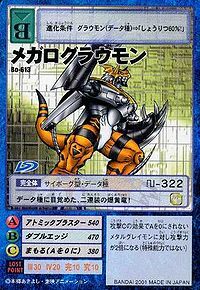 Its card is part of the 3 Color Megalo Growmon (３色メガログラウモン Sanshoku Megaroguraumon) set. 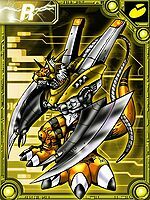 This doubly-equipped, explosive golden dragon has awakened as a Data attribute! It has metallised its upper body with the strongest metal, "Chrome Digizoid"! This page was last modified on 6 April 2019, at 00:34.